Currently available in 3 sizes and capable of withstanding back/test pressures in up to 4.14 Bar. These unique bladder designs have been tested to the extreme, in many cases up to five times their required inflation pressures. The NEW LANSAS Multi-Size Medium Pressure Plugs have the highest rated back/test pressures of any pipe plugs of the same size. Each pipe plug is equipped with 2 test ports, either a 25mm or 50mm (F) NPT and the second either a 6.3mm or 19mm (F) NPT. The Lansas® Products Rupture Protected plugs have a built in air relief valve that will prevent the plug from being over inflated due to faulty gauges or operator error. Once the valve cracking pressure is reached, the Lansas® Relief Valve will open, relieving the excess air pressure and reset / reseal at or just below the Required Inflation Pressure for the plug. No more catastrophic plug failures due to faulty gauges. If the gauge is reading incorrectly and the end-user over-inflates the plug, the relief valve will crack relieving excess air pressure from the plug and prevent it from failing due to over-inflation. Operator error will no longer cause your plug to fail due to over-inflation. When the Air Relief Valve cracks, it relieves the excess air pressure in the plug, but does not completely deflate it, allowing the plug to stay inflated and in service. Unlike other manufacturer’s rupture protection devices that cause the plug to completely deflate resulting in testing failures, down time on jobs and leaves you with a temporarily unusable plug, the LANSAS® Products Rupture Protection Air Relief Valve safeguards your plug without the mess and frustration. The Lansas® RP relief valve is recessed mounted to prevent physical damage when the plug is being transported, during installation or use. 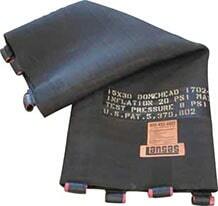 The Lansas® RP Rubber Dirt Cover helps protect the relief valve against the harsh work environment. Dirt and debris is kept away from the valve while the RP Rubber Dirt Cover remains in place. The Lansas® RP relief valve is a multi-use device and will relieve over and over, unlike other manufacturers who offer a one time use solution requiring you to purchase replacement units again and again. Our less costly relief valve will protect your plug for many uses. The Lansas® Products RP Rupture Protected Plugs relieve once the plug is over-inflated to approximately 33% above the Required Inflation Pressure of the plug. The Lansas Domehead is the most durable multi-size pipe plug available. The unique design of this plug is covered under two U.S. patents. The first patent relates to the 2-ply of cross biased tire cord reinforcement (moreon larger sizes). This design allows for controlled expansion of the plug. As this plug inflates it gets larger in diameter and shorter in length. By changing the shape of the plug the side wall stress is kept to a minimum, and this feature also eliminates the longitudinal tearing (end to end) found in plugs by other manufacturers. The second patent covers our superior end design. The ends are reinforced with a steel “spider” ring wrapped in fabric. The fabric extends from the spider into the body of the plug. This advanced design transfers the stress of inflation from the steel base plate to the fabric reinforced spider ring. These designs, along with the highest quality materials create a line of pipe plugs that are as much as 50% lighter and substantially more flexible than our competitors. 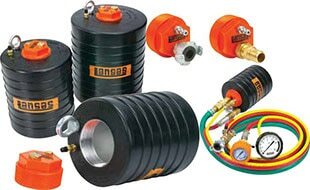 The Lansas Domehead are manufactured and stocked with our standard ozone protected natural rubber outer layer.They are also available with a nitrile or neoprene layer, as well as stainless steel end plates for use in chemical and petroleum applications. The 050 Series Domehead Back Plugs are designed with lifting eye(s) on both end(s) and a 1/4″ inflation port. Larger sizes have an additional 1/2″ inflation port. The 051 Series Domehead Front is equipped like the back plug, however, it also includes a 1/4″ + 3/4″ test thru port for air testing and pressure monitoring. EXTEND THE LIFE OF YOUR PLUGS! 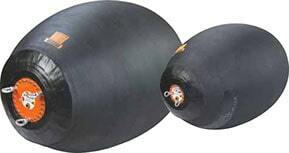 THE LANSAS PROTECTIVE SLEEVES not only protect the plug while being moved around the job site, but stays on the plug while inflated in the pipeline. 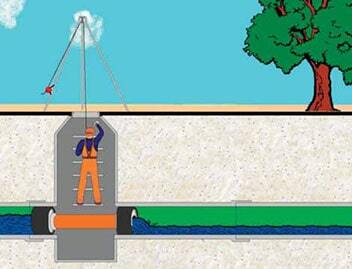 These sleeves help eliminate damage from pipeline debris, degraded pipe, and more. THE MULTI-SIZE FLOW-THRUS are built with the same patented designs as our multi and single-size Domehead™ plugs. The Flow-Thru™ plug goes one step further by offering a large bypass within the pipe plug. 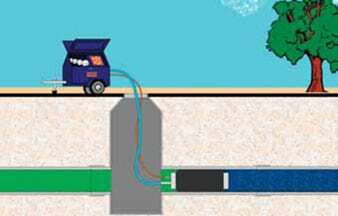 The bypasses are ideal for doing a water test or sewer bypass. Lansas® Flow-Thru plugs are available with standard bypasses up to 8″ NPT. 12″ threaded connections and larger flanged connections can be special ordered. 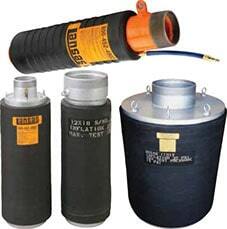 As with any Lansas plug, the multi-size Flow-Thru’s can be manufactured with nitrile or neoprene rubber and stainless steel components for use in chemical and petroleum applications. Test caps are available to convert your Flow-Thru™ pipe plugs over to use in air testing applications. A PVC cap is supplied with each plug with up to a 6″ NPT by-pass. THE LANSAS® MW™ is the most versatile and cost effective single-size pipe plug available. Our 4” to 24” MW’s™ are molded with “o-ring” sealing ribs and each plug is equipped with a replaceable bypass pipe. Our 15” through 24” MW’s come with either a 4,” 6,” or 8” bypass. For air or water testing, sewer bypass or simply stopping the flow, the MW offers the best value in single size plugs. Converstion Test Caps are available to allow use of flow-thru pipe plugs in air testing applications. A PVC cap is supplied with each plug with up to a 6″ NPT by-pass. The LANSAS SST (Single Size Test) Plug is similar in function to our M.W. 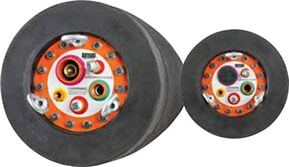 plugs, but the SST is built with a newly formulated natural rubber compound. These plugs are the most durable, versatile, and toughest single size plugs available today. The SST Plug is designed with multi-function in mind. Available in 8”, 10”, and 12” sizes, each of these have a 3” female aluminum by-pass. These plugs can be used to stop flow, for sewer by-passing, or for air testing. 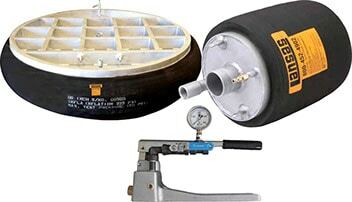 An air test conversion cap comes supplied with every SST Plug. Lansas manufactures pipe plugs with interchangeable ends. These plugs can be selected with the exact bypass needed to fit your application. Pipe plug sizes start at 355mm and can be custom fabricated as large as 2438mm in diameter. The bolt-on covers can be equipped with threaded bypass connections up to 300mm (M) NPT, flanged connections or an open tube end for use as a Super-Flow™ style plug. For example: As pictured, this 455mm x 610mm Multi-Size Interchange™ Plug body, could have covers with – 100 mm(M) NPT, 150mm (M) NPT, 200mm (M) NPT, a 300mm tube end or a 355mm flanged bypass. 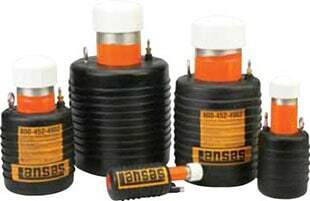 LANSAS HIGH PRESSURE TEST PLUGS are designed to seal the host pipe to pressures up to 150 PSI. 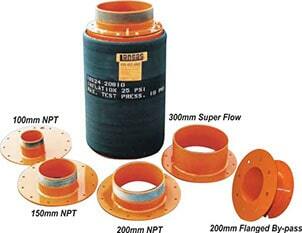 * These pipe plugs are equipped with a centered bypass pipe for inducing your test medium into the pipe. Larger sizes also include a second bypass for bleeding air out of the section being tested and monitoring the test pressure. The plug bladder, which is reinforced with multiple layers of polyester cord, is bonded to the inner metal mandrel. When this plug is inflated the ends roll up away from the mandrel. This allows the bladder to make contact with the pipe walls without applying unnecessary stress on the bladder. These plugs are excellent for use in water mains, force mains or industrial lines. As with all Lansas products, the high pressure test plugs can be custom manufactured to meet the requirements of your job. Developed to block flow in pipelines or for testing, LANSAS AR PLUGS, 32mm thru 150mm feature a zinc plated chain and ring. The entire range of these plugs through 600mm have test pressure ratings of as much as 15 PSI with air or water. Our (SSB) SINGLE-SIZE BLOCKING PLUGS offered in 200mm, 250mm and 200mm sizes with a newly formulated blend of natural rubber along with the AR™ PLUGS are the toughest and most dependable single-size plugs available. The SSB, like the SST comes with a removable 3/8” eye bolt and a removable 1/4” (M) NPT tire inflation valve. HE LANSAS SINGLE-SIZE DISC PLUG has been around for almost 50 years. Constructed of rolled channel steel, the standard Disc Plugs come as one-piece units. 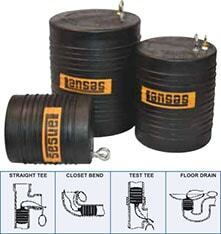 The LANSAS Disc Plug can be used for construction, rehabilitation, cleaning, and testing. 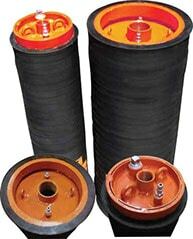 The bladders for these pipe plugs are reinforced with 2 plys of polyester tire cord.